It has been exactly one year since my last blog post. I haven’t posted anything for so long because I was busy working, and then finishing my Research Master. To avoid the temptation of not finishing my studies at all, and just go make things full time, I decided just to not blog at all. Now that I’ve handed in my MA thesis, I can finally spend more time making things and writing about it. That doesn’t mean that I didn’t make anything last year, though. 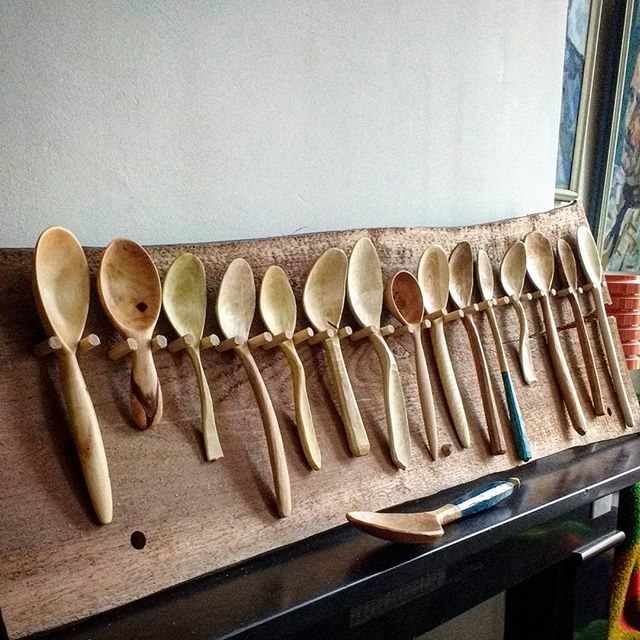 Quite the opposite: I carved more spoons than ever, and made quite a few other things. You can see what I’ve been up to recently on Instagram. With the end of my studies, also came a few other changes: I’ve recently moved into a new workshop. Or I should say: I now have a workshop. I used to do most of my work around the house. Mainly on the kitchen table, or on my desk behind my computer. You can imagine this was not ideal. The new place isn’t huge, but it has tons of daylight and is very close to where I live. It’s ideal for leatherworking and some smaller woodworking. I’ve recently made some big changes to the website. It used to be a blog, primarily, with a page for selling stuff. It’s now basically a webshop where I sell my products, with a blog. It’s still a work in progress, but it should be done soon. You can expect more frequent blog posts from now on. I’m building a small roubo-style workbench right now, which I’ll write a post on soon. I will also regularly put new products of for sale on the site. If you have any questions or suggestions, please let me know!